It was on that unfortunate afternoon of Black Saturday that the once luscious and green forest of Mt. Apo will be scarred for a long time. I was one of the few who witnessed the fire when it was still beginning to devour more than 400 hectares of land as of this writing. Our group arrived at the peak when the fire was already starting. 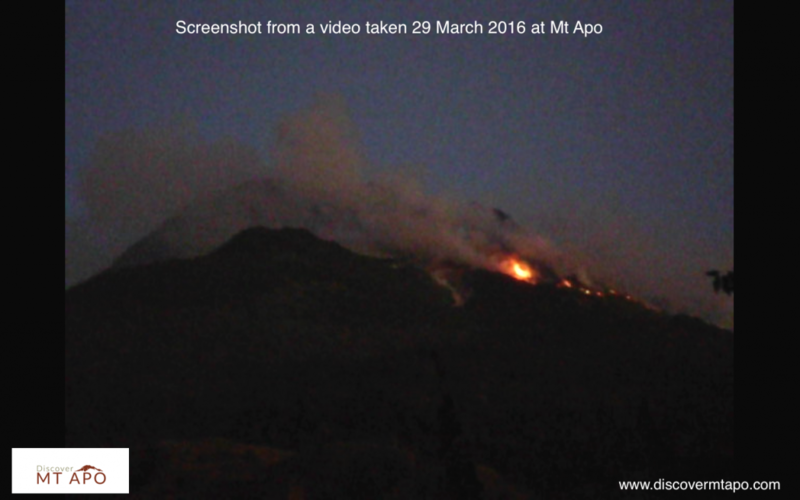 I was able to take a video of Mt Apo fire incident so people could see the damage that was brought upon by irresponsible mountaineers. I’m very disappointed by how people reacted to this incident. Some were pointing fingers as to who really did it and some were bashing those climbers who were there on that day. There is really no point in doing this since the damage has already been done and there is no more way for us to determine who really did it. The authorities are saying that it was caused by a bonfire left by some campers the night before but this is still unverified, hence, we cannot consider this as a fact. There were stories that came out that it was caused by one of the members of our group, the German doctor and his guide, but this is NOT TRUE. I am the living testimony that it was just a lie fabricated by people who are running out of fingers to point at in this fiasco. Who would have thought that such a brushfire when I first saw it, had already made a huge impact on the country’s tourism economy, nature and the locals living in that area. Firstly, aside from being the country’s highest peak, this mountain also offers a lot of scenic views and interesting experiences, hence, one of the must-climb places for a mountaineer. There are a lot of foreigners and locals who climb this mountain for various reasons. They spend money to pay for the fees and the permits which adds to the government funds. Secondly, this is home to one of the endangered species of birds in the country- the Philippine eagle. It is heartbreaking to know that one of their habitats has already been destroyed and it will take a long time for it to recover. Thirdly, there are many natives living in that area. They grow crops and vegetables as their source of livelihood. They also offer services for climbers and trekkers alike. Now that the mountain will be closed for 5 years, they will have to find another way to sustain their living. I was part of the many trekkers who climbed Mt Apo n on that Holy Week. I had my own special reason for climbing. Each of us who were there, have their own reasons why they were there and took the challenge to reach the peak. Some may have been seeking that solitude that has long escaped their lives. Some may find peace while surrounded by nature. Some may have found mountain climbing as their passion. But for whatever reasons we may have, it was just so unfortunate that the fire happened. I’m very sure nobody wanted to hurt Mt. Apo. For all those people who were not there and who are just updating yourselves through social media may you find peace in reaching out to help in any way you can instead of saying negative things towards the climbers, trekkers and authorities – especially those people who even didn’t climb the mountain and keep on bashing our trekkers that climbing is just for show-off, please try to validate your reasoning why there is so much hate? For all those who climbed Mt Apo before the incident, we appreciate the concern and support that you are giving. To all people, the least you can do is to pray that the fire will be finally put out and the recovery process would speed up. If your time and resources would permit you, then perhaps you could lend a hand by volunteering or sharing awareness with regard to the effect of irresponsible mountaineering. This is also a high time for us to be aware of the 7 environmental principles so the same incident would not happen again. Our call to everyone to pray and unite to #savemtapo. My Journey to Mt Apo – Part 2: Black Saturday Fire at the Peak Surigao Island Tour – The best destination this summer!